The U.S. average retail price of diesel surged 4.5 cents to $3.070 as oil jumped to more than $65 a barrel. It was the third consecutive week of average diesel prices above $3. Diesel now costs 50.8 cents more than it did a year ago, when it was $2.562 a gallon, the Department of Energy said Jan. 29. Also, the average price has risen 9.7 cents per gallon in January. The price of trucking’s main fuel increased in every region. Prices spiked the most in the Midwest, 5.9 cents per gallon. The average cost was highest in California at $3.683. The U.S. average price for regular gasoline rose 4 cents to $2.607 a gallon and was 31.1 cents higher than it was a year ago, according to DOE’s Energy Information Administration. Gasoline costs more in every region, too, and the average price on the West Coast climbed 6.4 cents (the most) to $3.088. One owner-operator had a simple solution for handling increases in diesel prices. “I pull a double-drop stretch trailer. I use about 600 gallons of fuel a week. 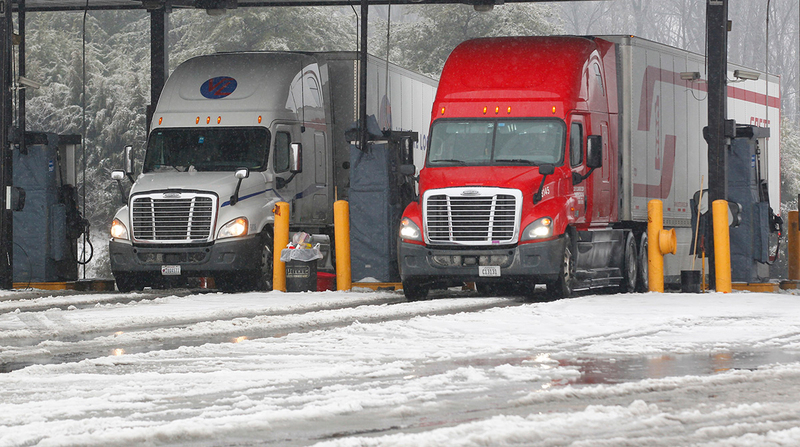 If the fuel price rises, I just raise my rates,” Robert Stover told Transport Topics. Now, diesel and oil prices are reverting “back to the mean” and come with a risk premium, Denton Cinquegrana, chief oil analyst at OPIS, told TT. For now, he sees few scenarios that could push oil back up to $100 a barrel, where it was last in mid-2014, and send diesel soaring. In sum, “Global GDP is on the rise, and the president is talking about infrastructure all the time — although how much has gotten done is debatable — so all signs point to strong diesel demand going forward,” Cinquegrana said. In the latest ICE Futures Europe and U.S. Commodity Futures Trading Commission data, money managers reported record wagers on continued price increases for both U.S. and global oil benchmarks, along with gasoline and diesel, according to Bloomberg News. West Texas Intermediate crude futures on the New York Mercantile Exchange closed at $65.56 per barrel Jan. 29 compared with $63.49 on Jan. 22. In related news, U.S. crude oil production reached 10.038 million barrels per day in November 2017, according to EIA’s latest Petroleum Supply Monthly. That total was the first time since 1970 that monthly U.S. production levels rose above 10 million barrels a day and the second-highest U.S. monthly oil production level ever, falling just below the November 1970’s production of 10.04 million barrels. The weekly U.S. oil rig count also climbed to 759 during the week of Jan. 26, 12 rigs more than the week before and 193 more than a year earlier, according to oil-field services company Baker Hughes. Iranian Oil Minister Bijan Namdar Zanganeh said that crude at $60 a barrel is “good” and warned higher prices will encourage production of more expensive supplies such as shale, causing prices to drop again, according to Bloomberg News. U.S. commercial crude oil inventories also increased for the week ending Jan. 26 by 6.8 million barrels, climbing to 418.4 million compared with the week before, according to EIA. That left the inventories in the middle of the average range for this time of year. Inventories of gasoline and diesel decreased in the period, with gasoline inventories near the top average range and inventories of distillate fuel — primarily ultra-low-sulfur diesel used in transportation and to a lesser degree as heating oil — in the middle average range. Also, oil traders are braced for an end to a record run of U.S. inventory declines, according to Bloomberg. The weekly U.S. oil rig count climbed to 759 during the week of Jan. 26, 12 rigs more than the week before and 193 more than a year earlier, oil-field services company Baker Hughes reported. The increase in rigs may be a signal that U.S. crude production is poised to rise, even as production jumped to 9.88 million barrels a day in the seven days to Jan. 19, the highest level in weekly data compiled by the Energy Information Administration since 1983, Bloomberg reported. Iranian Oil Minister Bijan Namdar Zanganeh said that crude at $60 a barrel is “good” and warned higher prices will encourage production of more expensive supplies such as shale, causing prices to drop again, according to Bloomberg.